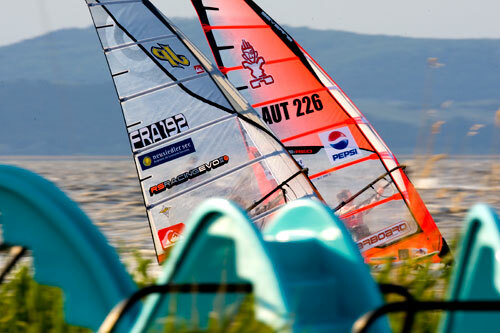 It was great to have a Slalom worldcup here at my homespot in Podersdorf. 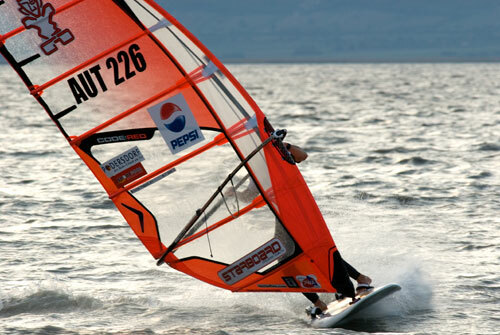 I really enjoyed to sail eliminations on the waters I know for many years. In the end the result was not the most important. I finished in 36th position overall. More important was the positive feeling in speed, acceleration and jibes. In two heats I could not make it up because of too wide and inactive jibing. In the first elimination I had the chance to score great, but had an over early in the second heat. But overall the distance to the top guys got smaller over the winter and the training seems to pay off. Within two days I will sit on the plane to South Korea for the second tourstopp. Powered up on the 8,1 Code Red (Â© Kerstin Reiger). Close to the finish line and Antoine came really close (Â© John Carter).